Finally the long wait comes to a close! Three books are lined up for release and two of them are almost entirely there. They will be available in India and in the US chiefly. These books are nonfiction and on history. 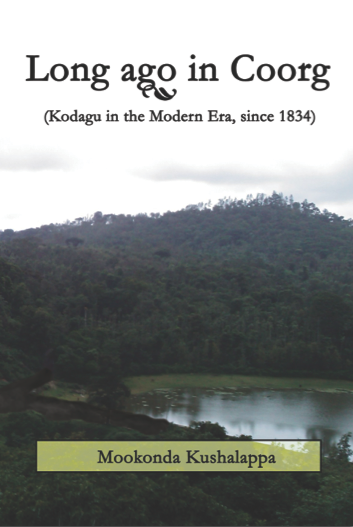 I was exploring the history of Kodagu, a local popular history. This work turned into a tome which has now been cut out into three parts and hence three books. A famous historian (Bloch) once stated that the accurate way to approach history is backwards. That is to study history from the present age, into the previous centuries and finally into millennia. The same historian asserted that history should be made interesting to all people. How did the small numbered civilian army of Kodagu (comprising of farmers who carried arms and with courage) keep the larger well-trained and equipped regular army of the British East India Company at bay in 1834? How did the British help build Kodagu's economy? How were Maharaja Ranjit Singh, Mahatma Gandhi, Jawaharlal Nehru and Vinoba Bhave connected to Kodagu? Who were Pandyanda I. Belliappa (also called 'Kodagu's Gandhi'), Guddemane Appaiah Gowda, Cheppudira M. Poonacha and the others? What were Kodagu's contributions to India and to Karnataka? What was the outcome of the numerous elections fought in Kodagu since Independence? What were the origins of the Jamma Bane issue, regarding the Kodagu farms, and why does it continue? How did Kodagu come to be called by the now well-known brand name Coorg? 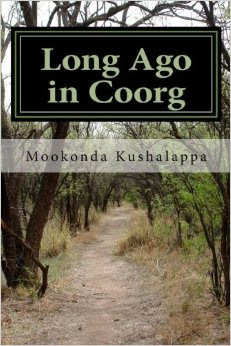 For solutions to these and more similar questions, read 'Long Ago in Coorg'. This book is in paperback and in e-book format. It is available for Kindle e-book reader as well. Who were the mythical sages, village gods and heroes of Kodagu? Why was a clarion call made in 1174 by a Raja (Pemma Virappa) to all Coorgs of all regions to gather for battle? 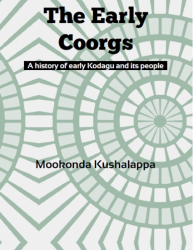 Why are the Coorgs, a Hindu (meaning 'ancient Indian') people of Kodagu, and their culture called distinct? Many have attempted to decipher the origins of the Coorgs and failed. What makes this puzzle so interesting? The author puts together the pieces of that same puzzle and solves it for you, in not one way but more than two ways. Read 'The Early Coorgs'. Under the Wodeyar Rajas the state language of Mysore (Karnataka) was Kannada. But under Tipu Sultan Persian was made the official language in Mysore. Tipu gave places Persian names. Mysore was renamed Nazarabad while in Kodagu Madikeri was renamed as Jafarabad and Bhagamandala was called Abjalabad. It is strange that some writers claim that Tipu Sultan patronised Kannada. It is again strange that some writers claim that Tipu was tolerant. The problem lies in such people seeing everything in black and white and not in shades of grey, as in the case of Tipu Sultan. Tipu Sultan was known to have persecuted the people to the west of Mysore, for instance the Kodavas of Kodagu, the Roman Catholics of Mangalore, the Nairs and the Moplahs of Malabar and the Brahmins of Malenad and Malabar. He was known to have destroyed temples in Kodagu and in Malabar in the 1780s (before the third Anglo-Mysore War, 1789-1792). On the other hand, he however patronised the temples of Srirangapatna and Sringeri and retained some Hindu ministers in the 1790s (after the third Anglo-Mysore War, in which he was defeated by the British).4 Hence to Tipu Sultan people and temples seemed to be more of a political value than of any religious value. He must have been a shrewd leader who knew how to gain politically during his times. A few well-known writers (like Ko Chennabasappa or Ko Che) calling Kodavas 'outsiders' unfortunately speaks of their ignorance.7 Humans didn't arise spontaneously from the earth; they all have descended from common ancestors who lived 60,000 years ago in Africa. So, hence all humans are basically Africans by descent. 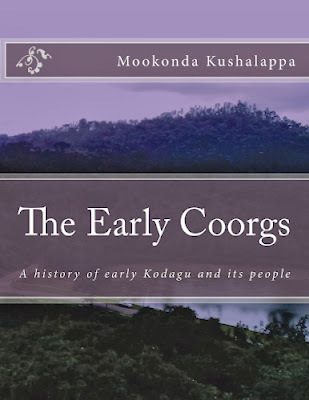 Over many years humans moved over continents and settled down in different places across the world.8 Kodavas have a known history in Kodagu dating back to more than a thousand years and were the earliest known agriculturists in the region.9 Writers like Ko Che sadly tend to be biased and they highlight the dispute that existed between Kodagu and the Mysore Sultan for a while at that time in the past without understanding the circumstances existent then. This article was published on www.coorg.com (as 'Kodavas & The Mysore Sultan - And the Ignoramus Ko Channabasappa', the title was edited by Shambu Muddaiah and images were added from Google Images/Grab) and in the Kodagu newspaper Coffeeland News (as 'Kodavas & The Mysore Sultan') in January 2014. Bowring, L. 1871. Eastern Experiences. London: H. S. King. Bowring, L. 1893 . Hyder Ali and Tipu Sultan. Delhi: Idarah-I Adabiyat-I Delli. Kamath, Dr. Suryanath U. 1993. Karnataka State Gazetteer: Kodagu district. Bangalore: Government Press. Krishnaiah, D. N. 1974. Kodagina Ittihasa. Mysore: Prasanga (Kannada). Kutty, K. Govindan. "Tipu Sultan and Doordarshan". Tipu Sultan: Villain or Hero? : An Anthology 56-66 (Sita Ram Goel 1993). New Delhi: Voice of India. Mill, James; Wilson, Horace Hayman (1858). The history of British India, Volume 5. London: Piper, Stephenson and Spence. Staff Correspondent. "Writer asked to apologise for 'glorifying' Tipu". The Hindu. 28 Dec. 2013. Wells, Spencer. 2007. Deep Ancestry: Inside the Genographic Project. USA: National Geographic. Wells, Spencer. 2003. The Journey of Man: A Genetic Odyssey. UK: Penguin. The word Puthari comes from Puth Ari meaning ‘new rice’. It is the harvest festival of the people of Kodagu. Formerly, Puthari was a week-long celebration. Paddy is harvested in the Kodava month of Birchyaar (around December, when the sun is in the zodiac sign of ‘Scorpio’) in Kodagu. Incidentally, Puthari is celebrated in North Malabar as well, three months prior to the Kodagu festival, because rice is harvested there in the month of Leo (around September). The priest at Ammangeri village (near Padi Igguthappa temple in Kakkabe) decides the day and the muhurta (an ‘auspicious time’) of the festival based on his calendar and the appearance of the full moon. The festival is prominently celebrated at the temple of Padi Igguthappa. Houses are cleaned and painted before Puthari. On this day, a special dessert called Thambutt made from rice flour and mashed bananas (of the local mara bale variety) is prepared in Coorg homes. Each helping has grated coconut sprinkled upon it and a small hole made, in which a spoon of ghee is poured. On the night of Puthari, around an hour after dusk, the nere kattuvo (ritual ‘tying of leaves’) ceremony takes place. Members of the family gather in their farmhouse. Leaves of certain trees are tied together, these are called the nere, and placed on a mat. This is followed by the kad edpo (ritual ‘cutting of paddy sheaves’) ceremony. They then go down to the fields in the moonlight where one woman carries a lamp. Everybody cries out Poli Poli Deva (‘May we prosper, O God!’). The eldest man of the family cuts an odd number of kad (paddy sheaves) and hands them over to other family members. They all then head back to the house where they place the sheaves before the prayer lamp. The youngsters then tie the nere at prominent places in the house. Firecrackers are burst later in the night. This is followed by feasting at dinner time. The next day the mane paado (‘singing at houses’) ceremony takes place. Two or four singers with traditional hourglass drums, each drum is called a Dudi, go from house to house in the hamlet. These singers will sing and beat the drums at each house. Each song they sing eulogizes the members of that house. They are followed by youngsters of the hamlet. A few days later the people go to the Mand, the ‘traditional village greens’, in the evening and dance the Kolatta (the ‘stick dance’ or Dandiya). Kodagu is also called Coorg, and is located in present-day Southwestern Karnataka. The region of Karnataka gave rise to Kannada and its sister languages and dialects such as Kodava thakk ("speech of the Coorgs"), Tulu and Arebhashe (which is similar to Tulu, Kodava thakk and Kannada). While the brave fight of the Kodagu (Kodavas and others) people against the invading British was in the Coorg War of 1834, the brave fight of the 1837 rebellion was mainly by the Tuluva (meaning "Tulu speaking") people of Sullia and Bantwal (parts of Tulu-speaking Dakshina Kannada), who were Tulu-Arebhashe Gowdas, Bunts and others, to the northwest of Kodagu. Rebels from parts of Kodagu, including Kodavas and Kudiyas, joined the rebels from Sullia (known as Sulya during the British Raj) and surrounding parts in 1837. Two articles published on 5th March 2013 in the Spectrum of the Deccan Herald were initially from an unpublished history monograph based upon the 1837 event, that I wrote in 2012 and submitted to them. Originally a single article, it had been split into two articles on the newspaper page: 'Account of an Uprising' and 'Fate of the Insurgents'. 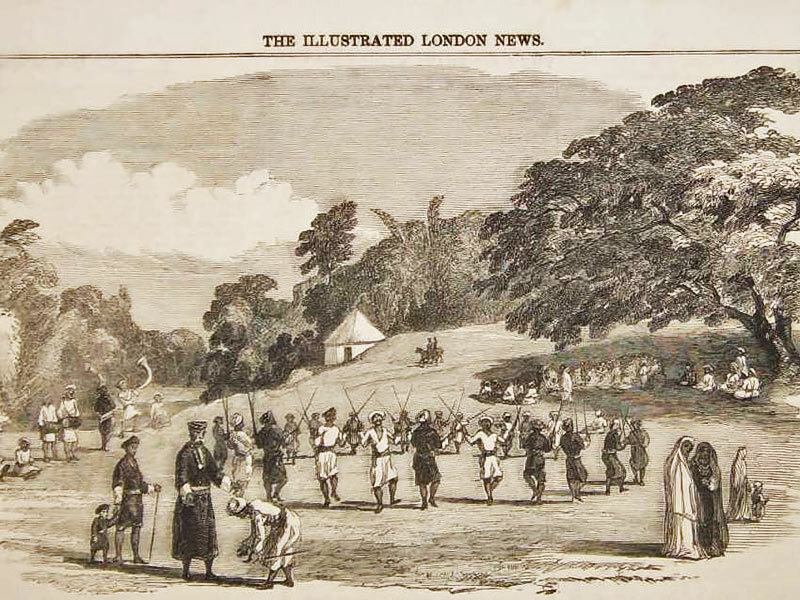 These two articles largely speak of events pertaining to Kodagu, and its surrounding regions, during the period between 1834 until 1837, beginning with the invasion of Kodagu by the British East India Company in 1834 and ending with the Rebellion of 1837. 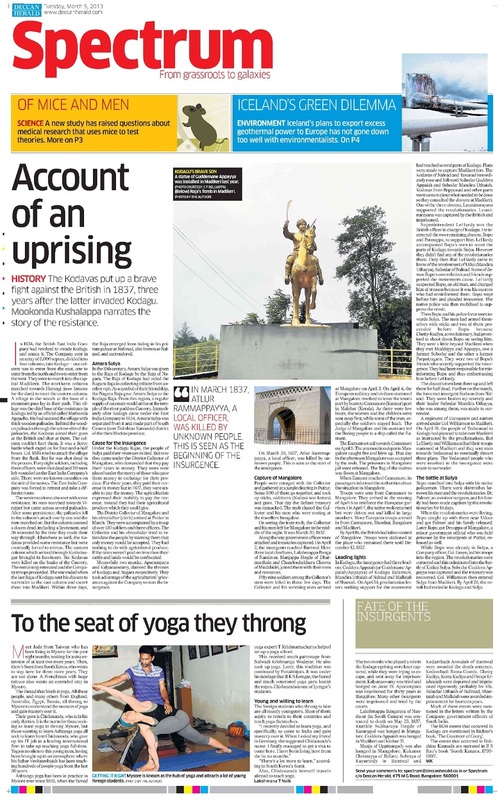 The first article speaks of the Coorg War of 1834 to some extent and mentions one of its heroes: Mathanda Appachu, a Kodava chieftain. The Company suffered several casualties while trying to enter Kodagu but finally the last Raja of Kodagu gave up resisting and chose to send his Diwans to surrender to them. Then the same article goes on to talk about the 1837 rebellion. The people involved in the 1837 events and the sources for the first article are mentioned in the second article. Readers who didn't read the newspaper edition, generally had read only the first article online and not the second part, which was also available online. This second part had the names of the rebel leaders and the sources used. In the newspaper, my initials (as MK) was mentioned for the second article, while online the same article remained uncredited. A picture of the newspaper page with the two articles is given below. In 1834, the British East India Company invaded Kodagu. 6,000 sepoys were sent in four columns: one from the north, one from the east and two from the west. The Northern Column met with resistance near Harangi (the location of the Harangi dam). In midst of a forest there at the base of a hill was a village which was fenced with wooden stakes. Coorgs (natives of Kodagu), armed with primitive guns of that age and led by Mathanda Appachu, were behind those wooden stakes. These stakes had slit holes through which they aimed the guns at the enemy. The marching British sepoys were fired at from this vantage position. For four and a half hours the sepoys tried to cross that location but couldn't. Col. Mills tried to attack the village from it's side but was shot dead in the attempt. That day the British side had forty eight casualties, including three officers. The Column then retreated and took a different route. Near Virajpet town, the Western Column as well met with some resistance; those parts were also fenced with wooden stakes. A dozen were counted dead, including a lieutenant, and 36 wounded in the Western Column. The Eastern Column meanwhile had made some progress. They carried short cannons called howitzers with them. They were able to break the Kodagu resistance by killing six of the natives and forcing their companions to retreat as they gradually advanced. However, the Raja of Kodagu, who was hiding in Nalknad (a place in Western Kodagu), sent his Diwans (Diwan Bopu and the other two Diwans) to surrender to the British. The resistance was then withdrawn and the Western and Northern Columns proceeded further into Kodagu. The Diwans accompanied the Eastern Column into Madikeri, the capital of Kodagu. Three days later, the Raja emerged from hiding and surrendered to the British who then sent him on exile. Two monks, Aparampara and Kalyanaswamy, led the rebels against the East India Company between the years 1835 and 1837. The two pretended to be relatives of the last Raja of Kodagu in an attempt to become the kings of Kodagu (Coorg) and Nagara (a former kingdom of which Dakshina Kannada/South Canara formed a part), both neighbouring regions in the south-western parts of present-day Karnataka. While Aparampara's attempt failed in 1835, native chieftains of Dakshina Kannada and Kodagu later came to support Kalyanaswamy. The main cause of the 1837 rebellion was the change in revenue collection in Amara Sulya. Amara Sulya (Sullia and it's surrounding parts like Puttur and portions of Bantwal) was detached from Kodagu (to which region it belonged to for a couple of centuries under the Kodagu Rajas) in 1834 and added to South Canara. Thereafter, unlike under the Rajas when the people of Sullia paid a revenue in kind which was assessed based on their yearly harvest, under the British East India Company the people of Sullia had to pay a fixed amount every year in money. In 1837, the farmers of Sullia were unable to pay the revenue. Taking advantage of this, one of the two mentioned monks, called Kalyanaswamy, who pretended to be a relative of the former Kodagu Raja, led the people of Sullia in a rebellion. They were joined in support by people from the surrounding regions in Kodagu and Dakshina Kannada. Atlur Ramappayya of Sulya, mentioned in the article's subtitle, was a British supporter and native chieftain who was feared by the rebels of Sullia before he was done away with during the outbreak of the rebellion. The rebels captured Mangalore, on the coast, and retained it for days, until European troops led by Col. Green arrived by sea from Cannanore (Kannur) and Bombay, two coastal Indian cities, and cruelly massacred the rebels. On the other hand, Superintendent LeHardey, the main British official who was stationed in Mercara (Madikeri, in Kodagu), managed to mobilise the native police of Kodagu and send them towards Sullia. Under his directions worked Diwan Bopu (Apparanda Bopanna), the leader of the native policemen. This Kodava Diwan was the most prominent native of the region and a leading officer of consideration. Bopu, who was from Nalknad of Kodagu, was however involved in a complication, some of his own relatives and friends supported the rebellion (see the article above and the section below). Yet, he led the native police force and helped quell the rebellion without the loss of much blood on either side. He recovered the money that the rebels, who had indulged in dacoity, looted from the Government treasury. He also pacified the civilians, removing their fears about the violence, and released those held prisoners by the rebels. Thus when Col. Green marched into Sullia he was able to secure it peacefully, without the bloodshed seen in Mangalore. Kalyanaswamy, Lakshmappa Bangarasu ('ruler of Banga'), Kumble Subbaraya Hegde and Manju (Manjayya), the last three were Bunt chieftains of Tuluva ("Tulu-speaking") South Canara, were later martyred in Mangalore in 1837 for their involvement. The name of a famous martyr in Kodagu is used in various forms in different sources. 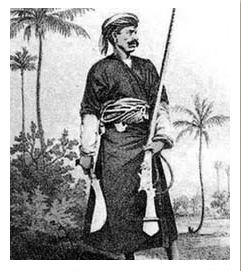 While we know him as Subedar Guddemane Appaiah Gowda (seen in the picture in the article, depicted as a statue, holding an Oidekatti, or a Coorg war knife, on horseback), different sources sometimes called the Tulu-origin chieftain as Guddera Appayya (or Appaiah) and as Guddemane Appaiah, like how Arebhashe speakers normally don't use the surname Gowda today. His clan members, an Arebhashe Kodagu Gowda family, are more well-known by their Tulu name Guddemane then by their Kodagu name Guddera. Kukanur Chennayya of Bellare, Subraya of Kayartody and Kedambadi Annaiah were awarded the death sentence. Other important rebels were Kedambadi Rama Gowda of Sulya, Peraje Krishnaiah, Chetty Kudiya and Kurta Kudiya of Kodagu. Some of the Coorgs, especially from Nalknad and Yedavanad, supported the rebellion, chief among them being Subedar Nalknad Uttu (Mandira Uthaiah), a Kodava chieftain, who was sometimes simply addressed as the Subedar of Nalknad (also called Nalnad or Nalkunadu, meaning "four shires"). The hereby named prominent rebels, who weren't executed, were sentenced to long imprisonment. We see that different communities of Dakshina Kannada and Kodagu, irrespective of caste, language and creed, participated in the rebellion of 1837 against the East India Company. The people who helped the Company officers suppress the rebellion were mainly native police men who again belonged to different communities. When the British East India Company wanted to share the loot money among the native police, the latter refused it. Instead their officers were honoured with medals (which bore a strange design of the Coorg arms) and other prizes. 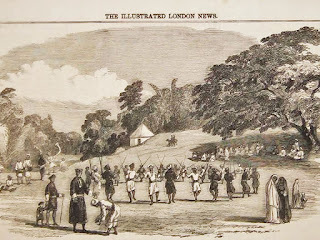 The main beneficiaries, however, were prominent British officers (such as Superintendent LeHardey and Col. Green) and loyalist native chieftains of Kodagu and Dakshina Kannada (individuals like Ranga Baliya, a South Canara landlord who supplied provisions to the British sepoys, Diwan Bopu, Subedar Koravana Biddaiah, Jahagirdar Chabhumiya, Munshi Thimmaiah, Munshi Nanjappa, Monnien, Kollira/ Kolera Achchaiah, Karineravanda Muddayya, Chuvachali Bhimu, Natolana Nanjappa, Fakre Ali and others). Richter's book 'Gazetteer of Coorg', a source, has some factual faults, and is sometimes prejudiced in a few parts, but it can be excused considering that the author's fact-finding and verifying resources were limited at that time. Many secondary sources simply cite the colonial sources, which projected a racist picture of the whole event in keeping with the East India Company's divide-and-rule policy. 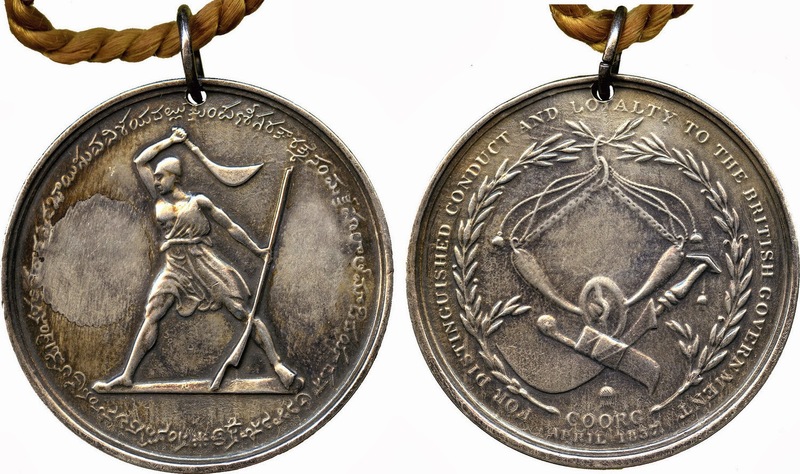 The loyalist native officers were issued Coorg medals in 1837, these Coorg medals were mostly made of gold or silver. The specimen shown in the picture above was one such Coorg medal that was for auction; the image is from the online catalogue of A. H. Baldwin & Sons Ltd (in London, UK) and used by them for advertising purposes. The warrior depicted in the coin holds a gun and an Oidekatti but strangely his dress is not a Kuppya, the Coorg dress which resembles a long kurta (Indian shirt). Also the medal bears an image of the Coorg arms in an arrangement which is very different from what is commonly seen on the Coorg emblem. All the Coorg medals found so far bear the same design. 1. Read N. Shyama Bhat, instead of B. S. Rao, in the second article that I wrote, at the bottom of the newspaper page. Bhat's book, "South Kanara 1799-1860", G. Richter's 1870 book "Gazetteer of Coorg" and certain letters of the British Era were important sources for this article. 2. Read Shanthaiah and Mallaiah as a single person's name: Shanthalli Mallaiah. The sources, from where the individual names were referred, have mistakenly called him as two different persons. 3. Also, the caption of the second photograph reads 'Raja's Tomb' in the newspaper but it is the 'Raja's Seat', found in Kodagu. Great way to begin the year. Besides the article, the two photographs in this page section were also mine. Errata: I made a typo which got printed: Chandragupta Maurya abdicated in 298 BC (not AD).